Synthetic peptide conjugated to KLH derived from within residues 1 - 100 of Human Tet2. 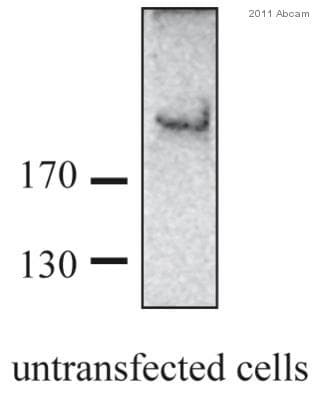 This antibody gave a positive signal in MCF7 whole cell lysate. ICC/IF: MCF7 cells. Our Abpromise guarantee covers the use of ab94580 in the following tested applications. WB Use a concentration of 1 µg/ml. Detects a band of approximately 224 kDa (predicted molecular weight: 224 kDa). Abcam recommends using milk (2-5%) as the blocking agent. Lanes 1 - 4: Merged signal (red and green). Green - ab94580 observed at 250 kDa. Red - loading control, ab18058, observed at 130 kDa. ab94580 was shown to specifically recognize Tet2 in wild-type HAP1 cells along with additional cross-reactive bands. No band was observed when Tet2 knockout samples were examined. 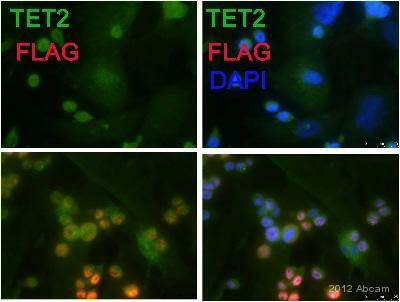 Wild-type and Tet2 knockout samples were subjected to SDS-PAGE. Ab94580 and ab18058 (Mouse anti-Vinculin loading control) were incubated overnight at 4°C at 1 µg/ml and 1/10,000 dilution respectively. Blots were developed with Goat anti-Rabbit IgG H&L (IRDye® 800CW) preabsorbed ab216773 and Goat anti-Mouse IgG H&L (IRDye® 680RD) preabsorbed ab216776 secondary antibodies at 1/10,000 dilution for 1 hour at room temperature before imaging. Additional bands at: 300 kDa, 55 kDa, 70 kDa. We are unsure as to the identity of these extra bands. Based on this data we recommend using milk as the blocking agent. We welcome customer feedback and would appreciate any comments regarding this product and the data presented above. ICC/IF image of ab94580 stained MCF-7 cells. The cells were 100% methanol fixed (5 min) and then incubated in 1%BSA / 10% normal goat serum / 0.3M glycine in 0.1% PBS-Tween for 1h to permeabilise the cells and block non-specific protein-protein interactions. The cells were then incubated with the antibody ab94580 at 10µg/ml overnight at +4°C. The secondary antibody (green) was DyLight® 488 goat anti- rabbit (ab96899) IgG (H+L) used at a 1/1000 dilution for 1h. Alexa Fluor® 594 WGA was used to label plasma membranes (red) at a 1/200 dilution for 1h. DAPI was used to stain the cell nuclei (blue) at a concentration of 1.43µM. This antibody also gave a positive result in HeLa pfa fixed (4%, 10 minutes) cell types at 10ug/ml. 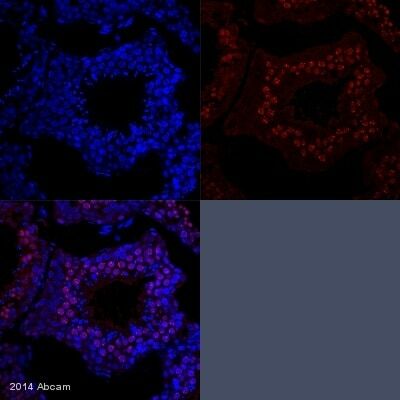 ab94580 staining Tet2 in Marmoset adult testis tissue sections by Immunohistochemistry (IHC-P - paraformaldehyde-fixed, paraffin-embedded sections). Tissue was fixed with formaldehyde and blocked with 5% milk for 30 minutes at 25°C; antigen retrieval was by heat mediation in Dako antigen retrieval solution. Samples were incubated with primary antibody (1/100 in 5% milk) for 18 hours at 4°C. 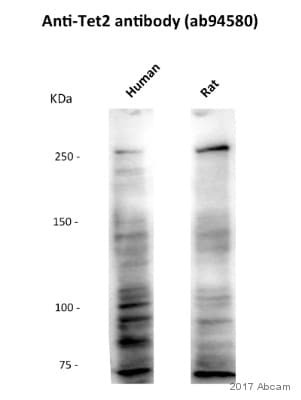 An Alexa Fluor® 555-conjugated Goat anti-rabbit polyclonal (1/500) was used as the secondary antibody. Publishing research using ab94580? Please let us know so that we can cite the reference in this datasheet.